When living with mobility issues or rehabilitating an injury, getting around isn’t as easy as it once was, and a wheelchair may be necessary for assistance. However, not all wheelchairs are created equal – many are specially designed for particular users and their conditions, so it’s important to first consider your lifestyle and the level of movement you need in your day-to-day regime. The information below serves as a brief wheelchair buying guide to help you choose one that is most suitable for your mobility needs. Standard Manual – The most basic model where the user can either self-propel themself without the assistance of a motor or relies on a caregiver to push it around for them. These chairs are typically collapsible and easy to transport between destinations. Fairly durable, manual wheelchairs typically have a footrest or leg rest, several arm variations and selectable seat sizes. 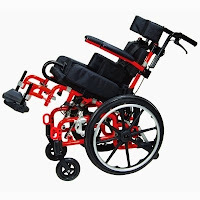 There are also extra-wide and lightweight manual wheelchair options available, like this Cruiser III Folding Wheelchair. Heavy Duty – Most standard wheel chairs are available as heavy duty models that are designed to offer wider seat widths and to hold weights up to 500lbs. The heavy build and larger size is ideal for keeping persons more comfortable. 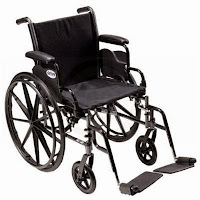 Heavy duty wheelchairs are also available in more lightweight, transport models. Bariatric – Designed to hold up to 1000lbs, Bariatric wheelchairs, like the Invacare Topaz Bariatric, are ideal for those needing an increased weight capacity and a roomier seat. Most have seats measuring 24, 26, 28 or 30 inches with several adjustment options to suit the user’s height and preference. Reclining – Reclining wheelchairs are designed to redistribute the user’s weight in a safe and comfortable manner. These will typically feature an extended head support and can be adjusted to any angle for better blood circulation, comfort and restful sleep. Several chairs are designed to where only the back moves when adjusted, while some others can feature elevated leg rests that can be adjusted for optimal comfort. Tilted – Unlike simple reclining wheelchairs that would leave patients staring at the ceiling, tilted wheelchairs allow for the caregiver to adjust the user so their gaze meets others’. These chairs are ideal for patients that have lost control of mobility throughout their body and require a more comfortable model. Many feature intricate pivot systems and a rotational design allowing for many different adjustment combinations. Pediatric – Lower to the ground and featuring a smaller build, pediatric wheelchairs are especially designed for children. These wheelchairs feature all of the available adjustments of a standard wheelchair but are better equipped to handle a significantly smaller weight limit with a shallow and narrower seat. Different transport, tilting and reclining models, like this Kanga TS Pediatric Tilt-in-Space wheelchair, are available to best suit the needs of each individual child. Powered – While they aren’t suitable for everyone, powered wheelchairs offer the greatest range of mobility with the least amount of exertion from the user or the caregiver. The design consists of the power base, which holds all of the mechanical parts, and the seating component. Power wheelchairs tend to be more expensive but are very easy to operate and can make a huge impact on a person’s independence when they are living with limited mobility. If you find yourself or a loved one needing a wheelchair, be sure to check out the selection of manual and power wheelchairs online from Preferred Health Care for quality products for a mobile lifestyle.